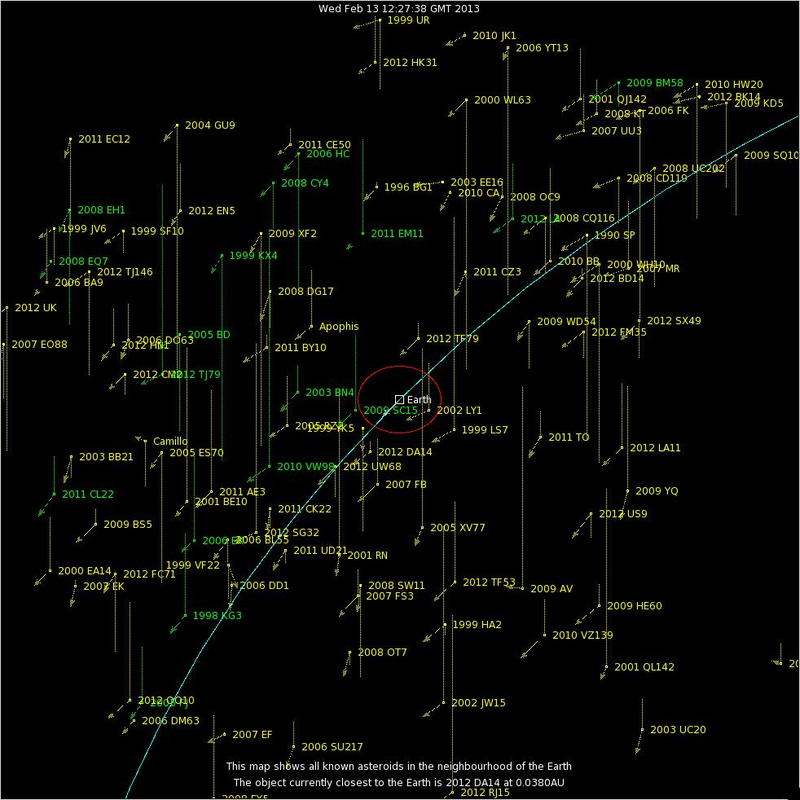 When you see computer-generated images of asteroid 2012 DA14′s February 15, 2013 close flyby – showing the asteroid near Earth in space, seen from a distant vantage point – you might see the Earth, the asteroid, perhaps the sun, and maybe a few other planets. 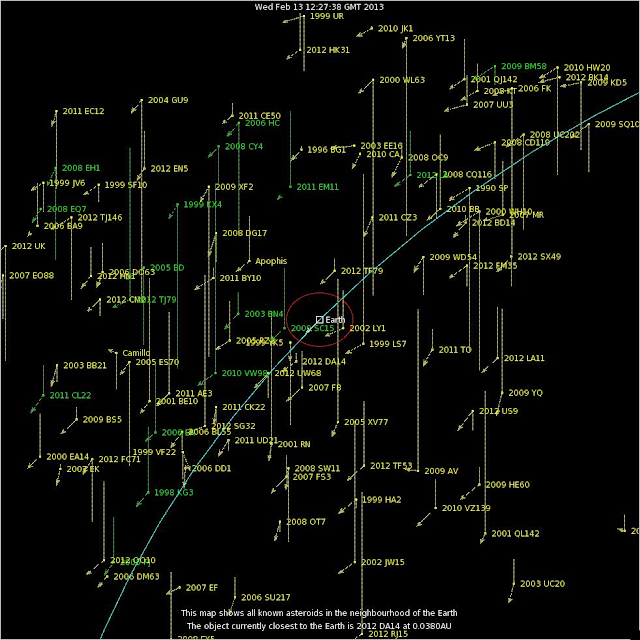 Here is another way to picture Earth and close-passing asteroids, from Armagh Observatory in Northern Ireland. The image below is near-Earth space today – February 13, 2013. It shows all the objects currently within 0.3 AU of Earth – that’s 45 million kilometers – or about 30 million miles – or about one-third of the distance between us and the sun. The red oval around Earth represents 3.84 million kilometers, or 10 lunar distances. TheMitchell Gallery, St. John's College in Annapolis, MD announces a call to artists for a national juried art exhibition, May 29 - June 19, 2013. Accepting entries in all media. Jurors: Joann G. Moser, Smithsonian American Art Museum, and Jack Rasmussen, Katzen Arts Center at American University, Washington, D.C. Online sales gallery. Open to artists living in the USA and Puerto Rico. See prospectus for details here. $40 for three works. Questions? Contact Hydee Schaller at hydee.schaller@sjca.edu or call 410-626-2556. MAP’S DO-IT-YOURSELF BENEFIT EXHIBITION, SILENT AUCTION AND PARTY! Maryland Art Place is thrilled to announce the return of Out of Order, the much-anticipated Do-It-Yourself spring benefit exhibition, silent auction and party! One of Baltimore’s most celebrated annual events, Out of Order is a one-night-only opportunity for collectors to acquire contemporary art at outrageously low silent auction prices. Both emerging and established artists present their original work in a first-come-first-served salon style exhibition, covering the walls of MAP’s Power Plant Live! gallery space. Artists and art lovers mix and mingle while enjoying music, wine, beer, signature cocktail and lite fare. Last year, nearly 300 artists took part in the silent auction exhibition and hundreds of guests gathered for the event! Proceeds from art sales are split mutually between MAP and the artist. Revenue generated at Out of Order directly supports MAP’s programming throughout the year. IMPRINT: For the second year, MAP will launch an amazing opportunity for one, select artist to be part of the IMPRINT artwork replication program. Launched through Out of Order this program offers prominent promotion of a singularly, selected artwork. Editioned replications will be sold throughout 2013 and the selected artist will be highlighted on the MAP website. Submissions will be accepted through March 1 with the selected work featured for sale at the April 5th event. All Artists are invited to participate. During the thrilling One Day Only, Do-It-Yourself installation, April 2, 7am – midnight, each participating artist hangs one original piece in the MAP galleries. For submission guidelines, please visit MAP’s website www.mdartplace.org. Join Washington Project for the Arts and The Capital Area Gay and Lesbian Chamber of Commerce, at WPA's new home in the Capitol Skyline Hotel, for a workshop on taxes and financial planning specifically geared towards artists and their unique challenges. Presenters from the Chamber will instruct attendees on the step-by-step basics of how to organize one's finances as an artist, from when to consider setting up a business account to how to keep track of your cash flow. Attendees will also learn how to tackle their taxes, focusing on the specific issues artists face such as multiple income sources and types, tax forms, and what deductions an artist may claim. Denise has been a financial advisor with Ameriprise (formerly American Express) for over thirteen years, with twelve years as a franchise owner. During that time Denise grew her practice from her role as sole practitioner to its current ensemble of three advisors, one para planner and one client service coordinator. Her practice, Bump & Associates, specializes in providing comprehensive advice to individuals, couples and small business owners on topics ranging from retirement planning to insurances, domestic partner planning to estate planning and tax planning. Prior to her work with Ameriprise, Denise ran a feminist bookstore in Dupont Circle for over 15 years, an experience she credits with giving her a unique perspective and understanding on the financial dynamics of a small business. These small business challenges translate easily to the challenges facing artists as they both have the need to manage cash flow, minimize taxes, and save for the short and long term while trying to create and sell product. Brian has been in the Financial Services Business for 10 years, having spent the beginning of his career in Banking and Securities. As a native of the Washington area, Brian grew up in Chevy Chase, Maryland, attending high school in Bethesda, Maryland. After graduating in 3 years from Indiana University, he began his career in Banking & Securities. Mr. Haney moved to his current firm, MassMutual of Greater Washington, over 5 years ago to work exclusively as a Broker serving a diverse range of clients in the market. This workshop is presented in collaboration with The Capital Area Gay and Lesbian Chamber of Commerce.